Logan Green adores Superman. He reads the comics. He wears the Superman emblem. He wants to fight bad guys when he grows up. Even his immobilization mask for proton therapy was emblazoned with the iconic “S.” For 5-year-old Logan, the Man of Steel was a comfort and an inspiration as he battled one of his biggest villains yet. In June, Logan walked into his parent’s room in the middle of the night, complaining of a headache. Minutes later, he collapsed. After he was airlifted to an Arizona hospital, Logan was diagnosed with an aggressive and inoperable brain tumor. His doctor gave him three days to live. At their friends’ urging, Crisandra and her husband Richard sent Logan’s information to Phoenix Children’s Hospital for a second opinion. Crisandra, who was nine months pregnant at the time, almost went into labor. “I got so excited that my contractions came on like crazy,” she says. Six days later, their son Peyton was born. For the Greens, it was two amazing miracles in one week. 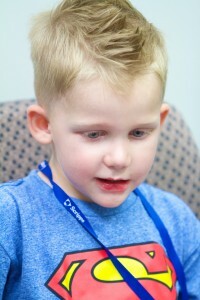 From his first day in the hospital, Logan channeled the strength of his favorite superheroes. After he was intubated, the nurses removed the wrist restraints that prevent patients from ripping out the respirator. Logan reached up to his mouth, felt the respirator and never touched it again. The nurses told Crisandra they had never seen a 5-year-old exhibit that kind of calm. With a plush Superman at his side, Logan spent 30 days in the intensive care unit then two weeks in rehabilitation following his surgery. To prevent the cancer from returning, Logan required radiation to kill any remaining cancer cells. Crisandra and Richard chose proton radiation therapy after learning about the reduced side effects of the treatment. The precision of the pencil-sized proton beam causes less damage to surrounding tissue than standard radiation treatment and helps preserve cognitive function. In August, Logan began daily treatments at Rady Children’s Hospital at Scripps Proton Therapy Center in San Diego, California. “The doctors were amazing. They really treated Logan like he was their own,” Crisandra says.